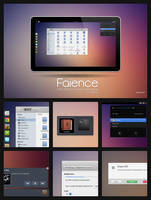 Faience is a Work In Progress that include GTK3, GTK2, Gnome-Shell and Metacity themes and an icon theme based on Faenza. 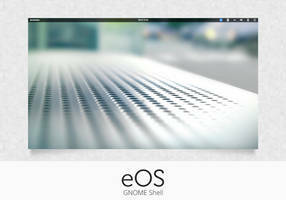 - Currently, it focusses mainly on Gnome 3 / Gnome-Shell. 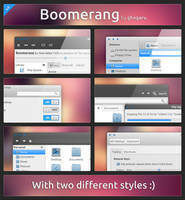 A support for Unity is provided since 0.2 trough Faience-Claire icon theme. 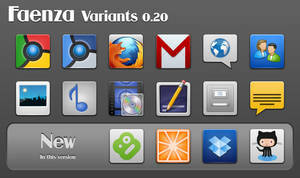 - Lots of icons are missing, thus it heavily depends on Faenza. Be sure to install it. Extract the zip file and put the 'Faience', 'Faience-Azur', 'Faience-Ocre' and 'Faience-Claire' folders inside your ~/.icons directory. 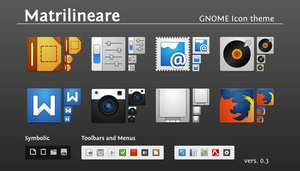 Use gnome-tweak-tool extension to select your Faience theme. Great pack! Will be repo available to Xenial?? Hi there! Is it your work still on the process? I am very interested on this. I tried clicking on the links for this one and Faenza, and they were unavailable. When will these icon packs be available? Are you still working on these, or have you moved on to other things? Can't find faience-icon-theme in the repository on Ubuntu 1404, while following above recipe - which ppa is it in now? 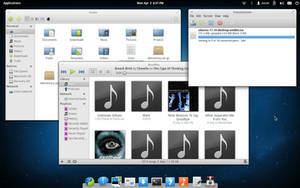 Depends on your distro and it likely is not in most repositories because it doesn't need to be. Themes and Icons are not needed to be installed in root so they don't need to have packages for installation. 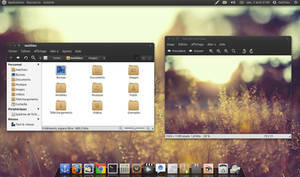 Although if you use the Ubuntu family then you can use the WebUpd8 PPA if you want to. Faenza and Faeince seem to be the same style...why the change in name? Faience has a slightly different appearance. It's heavily based on Faenza, but has a few differences like a more three dimensional appearance. Basically, it's like Faenza v2. It's a very good work. Could you drow a QGIS (www.qgis.org), DigiKam (www.digikam.org) and Darktable (www.darktable.org) icons (see my work). 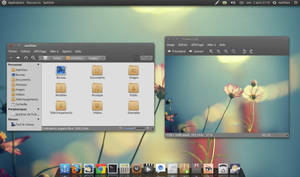 Could you please add icon for MATE desktop environment? I know there is mate-faenza icon theme but that's not on par with faience for me. Currently caja icon is under cover, but emgrampa and 'eye of mate' is not under cover. Even using the already existed icon is OK, if you can add mate related programs in, it would be quite nice for mate users. Also it would be quite nice if fcitx icon can be added, I'm sure a lot of CJK users will be very happy. I have a problem with this theme, which I had fixed in the past but I can't remember how. 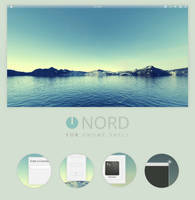 Beautyful theme, but the icons for .txt, .py and other types of text files, not showing and the gnome icon is used instead for the fiaence icon. Anyone have any idea for what is going on with that? 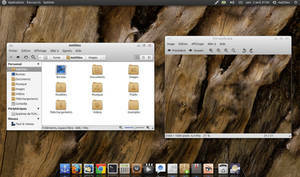 I'm using Ubuntu GNOME 14.04 LTS. I like this theme, but it seems not as complete as old Faenza. "- Lots of icons are missing, thus it heavily depends on Faenza. Be sure to install it." guess that explains it... plus he has been working at Canonical now. no telling when we will see any newer updates. Can you put dates in your changelog? I don't know if I should update because I don't know when the latest update came out. This has always been one of my favourite icon themes. I know that at this point you are working for Canonical Ltd. but, is there still a chance that you will keep updating this project? Will it be repackaged in the ppa for future versions of ubuntu(one day away from 14.04)? Is this even still in development or has it reach its end? PS. I also noticed that in previous version the link for the spotify-icon was incorrect, not sure if this has been corrected. How can i just use the icons for PLANK ??? i dont want to change any other icons just the ones in the dock. Sorry. i'm using eOS Luna. Thanks. How can I install it on Linux Mint 16 with Cinnamon DM? Since one or two weeks I've got a 404 on your ppa, anyone else ? Thank you for this info... I'm new to Linux and had no idea you could simply change the version in the ppa. Thank you for this amazing set ! Could you add saucy support in the PPA? Hey can you add a Sublime Text icon? One thing, though: could you make an install script for the theme similar to the icon set (that moves all of the files into /usr/share/themes)? 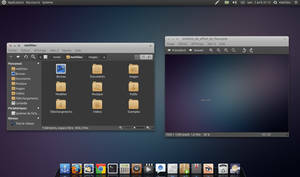 Selecting the zipped folder via the Gnome Tweak theme selector doesn't do that, so the GTK theme is not pulled into the Tweak menu. Hey, could you add icon for Sflphone? Nonetheless, thanks for the beautiful icon set, and continue to stay awesome! A fantastic icon theme and a real improvement over Faenza imho. Any chance you will provide support for dark panels? Thanks! 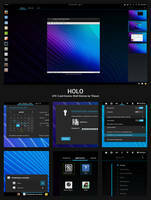 Awesome theme! Any chance of an icon for Quassel? It's the only one that doesn't look perfect in my dock. Assuming you are planning future releases (you're only on version 0.5), I'd suggest icons for TeXworks and SublimeText 2!! 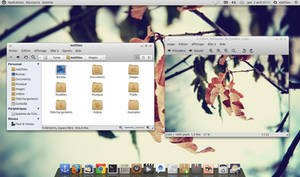 I've a question, Where is the icon "start-here" from Faience Clare set, I use Linux Mint Debian. Hi, which is better ? to create different size icons using gimp or to creat a svg art using inkscape? Could you make an icon for Sublime Text and Steam please? Also update the Google+ icon. Anyway I really enjoy your work.